You are currently browsing the trialbyfiregames blog archives for June, 2010. 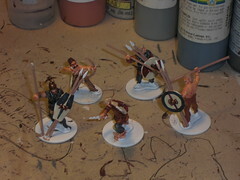 Roman uniformity makes the assembly-line painting process easy, and I generally paint ten at a time (a Century in the new scale I’ve been working on) and they come out pretty quickly. I tried that with the Celts and it took two weeks to finish them all. Not very assembly-line. So, I applied an old trick I figured out when I was painting Confederate infantry years back (funny how analogous Romans v. Celts is to Yankees v. Rebels…?). For purposes of clarity I will define what I mean by “assembly-line” here: painting figures in such a manner that whenever you open a color, you apply that color to all the figures down the line, and that color is usually always in the same place on each figure (sort of paint by numbers). 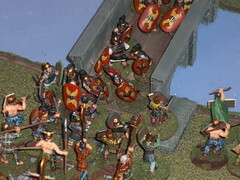 Example: Roman chainmail is gun-metal silver; their shields base dark red, bright red highlights; helmets are bronze, etc. Celts aren’t uniform enough to do this. In fact it is their individuality that makes them look like a Celtic army. What I had to figure out what that just because a mob looks diverse, you can select out any dozen people that are probably wearing the same jacket and pants color. That’s how I do the Celts. I pull out a small number, say five figures, and I mix their types: two heavy infantry, two light infantry, and a skirmisher (or two). These figures all get the same two colors for pants and shirt, but I switch that up as I go down the line (blue pants here, blue shirt there). Then, when I go back to do the plaid designs, I don’t need to keep swapping colors every time I come to a different base color. The plaids go faster, so the assembly-line begins to work. The next step along these lines was doing the same thing for the shields. I selected a base color for all the shields in the little group, yellow is in the example to the right. I broke up the pattern into quartered and halved shields, using black in this example, then did the reverse pattern in the yellow. For the chief I used a red swirl pattern to make him even more unique. I also did his plaid in red over blue (not sure if the pic shows this) to single him out a bit more. Contrarily, for the skirmishers, less is more, and I don’t always even do a plaid pattern on them (since they are the poorest members of Celtic society). You can see that the blue-on-blue plaid was much easier, because I was able to get into a rhythm by doing the same design more than once. Also, something else, on an aesthetic note: I used to do a single line grid for plaid, but that was not terribly satisfying, now I use a double-line (clearly shown in the blue plaid I think), that isn’t much harder to apply, and looks much better overall. The final step when deploying your army of Celts it to make sure too many of the same figs from one assembly line do not deploy next to their brothers. 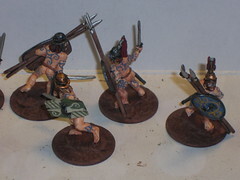 I like these Old Glory Gaesatae (naked warriors) because they anatomically correct… and they are easy to paint. 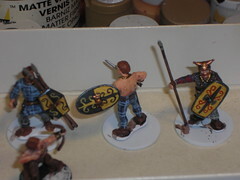 They pose a different challenge than normal Celts because as you can see they have no plaid pants to paint. While you could simply paint them in flesh tones, I think, particularly for Britons, woad tattoos are appropriate, and they really dress up your figs. Most of the patterns I’ve found on line show simple swirls, the most extreme examples being in the Osprey Celtic Warrior book where the spirals are so tight they would be impossible to paint with a normal brush. Therefore, I opened a book I have on Viking animal designs and tried to layer some of these in for variety. Viking designs are good because, 1) they are much more simplified than what we take as “celtic zoomorphic” styles which are only really in the Book of Kells, not likely painted on a primitive warrior; and, 2) Viking designs are heavily influenced by Irish and Caledonian celts, so they are not at all unlikely to find on Britons. I put the bigger animal designs on the backs of the warriors, while on one I did a Viking serpent wrapped around the warrior’s leg, across his back, and ending on his chest. 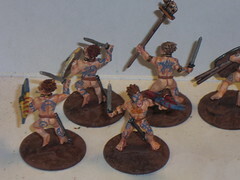 Long story short, they took a bit of time, and I’m glad I only had eight figs to paint in the first place! On a fig-conversion note, you might have noticed that I used the extra shield w/ spear pieces from Wargames Factory, rather than the plain shields supplied by Old Glory. I’ve only built half the figures in the Celtic Warband box, but I’ve already used so many of the extra shields for these figs (see my Celtic Cavalry too), as well as the extra heads that they supply to hang from the cavalry’s saddles, that I cannot recommend this line enough. Wargames Factory is very generous with their extra ‘bits’ and I hope they keep this up for their upcoming Viking line. I’ve recently gotten back into Roman history (I blame the movie CENTURION! ), and my favorite implacable foe, the Celts. Fortunately, I still had a mess of figures left over from last years’ “recruitment”, that I could start painting immediately. I even found a dozen primed auxilia in a box ready to go. Add that to some reading material, particularly Stephen Dando-Collins’ Roman Legions series, and I was off. On a side note, the two of his books I’ve read so far, CAESAR’S LEGION and NERO’S KILLING MACHINE (about the 10th and 14th legions respectively) are what I sort of call ‘ripping yarn’ history… full of great details and action, and just enough citation of the source material to be taken as history. Anyhow, I can’t recommend them enough if you’re looking for some great scenario suggestions. Which brings me to my subject heading: why do Romans? Unless you’re playing in a game very loosely based on reality, the Romans should always win a stand up fight against barbarians. 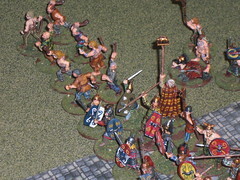 Paulinus’ defeat of Boudicca (outnumbered 2o to one or so) is an extreme example of this rule, but it proves the point. There is an inherent force multiplier in the Roman’s training, that the more of them they have on the field, the more deadly they become as an overall force. So why game them? When I got into wargaming 25 odd years ago, I was only interested in the “big picture” battles. The movements of Battalions and larger were all I was interested in because otherwise what are you simulating? Just some side show? Then as I got older, and read more battle accounts, I became far more interested in the private soldier’s combat experience, and small unit actions drew my attention because more often than not, the larger movement of troops were more predictable. You could see what was about to happen two turns in advance. This lead me to the skirmish game, and small unit actions, roughly the size of platoons or companies. The details of those ugly face-to-face battles are grim and unpredictable stuff, and that’s where the Guerrilla/ Barbarian tactics of certain armies can find an equal footing with their more disciplined, professional foes. This is where Varus is defeated by Herman, where Cerialis’ 9th legion cohorts are broken by Boudicca. Not multiple legions lined up in proper battle lines, but isolated cohorts fighting for their lives. I think this is where some interesting gaming can be found between the mighty Romans and the brave but woefully disorganized Gauls and Britons. To this end I’ve devised a new mini-Campaign concept that I will blog on about next time.